Browsing articles from "March, 2019"
YARN: Approx 120 yds of baby yarn. 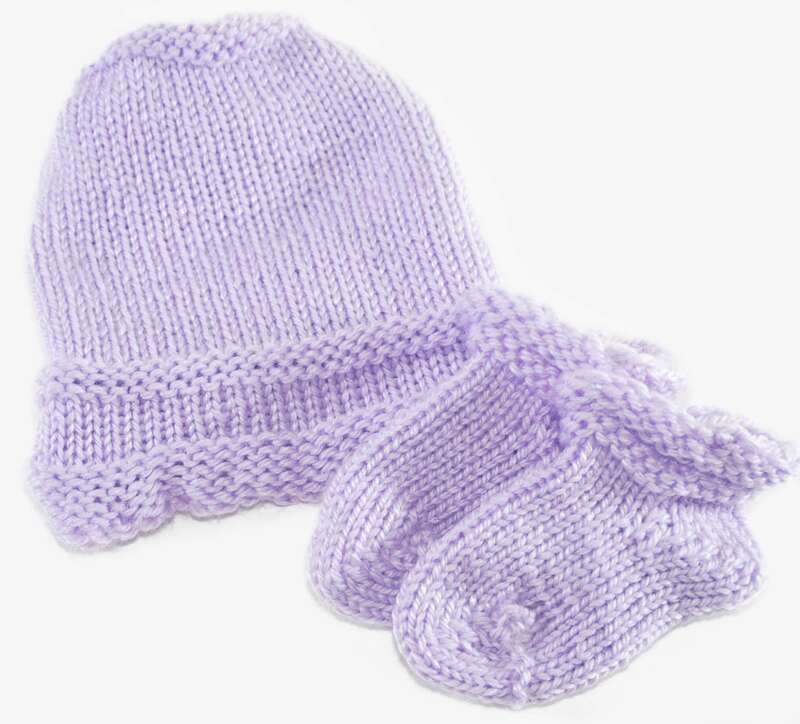 Sample knit with Bernat Softee Baby, Lavender. SIZE: Hat and booties recommended for 0-3 months. 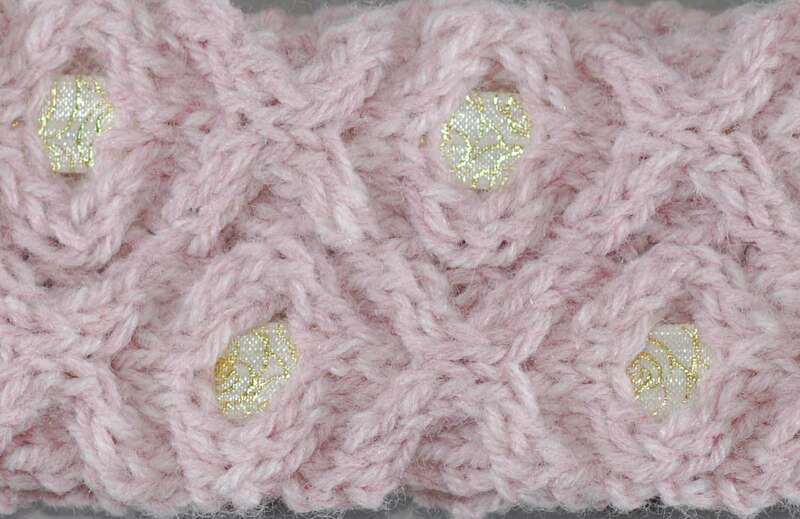 For hat 3-6 months, use ewrap knit stitch instead of knit stitch to create wider width. Cast on 56 pegs, green loom, prepare to work in the round. Round 1-5: Purl to end of round. Round 6-12: Knit to end of round. Round 13-15: Purl to end of round. Round 16: Knit rounds until measures 6 inches from cast on edge. Next 5 rounds: Purl to the end of round. 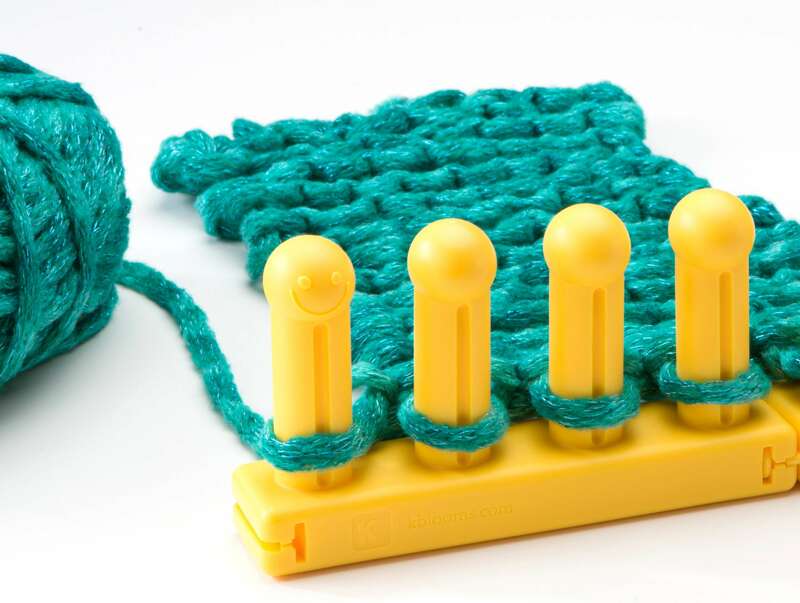 Next round: Purl round and knit 2 together, take the stitch from peg 1 and place it on peg 2. Purl these two stitches together. 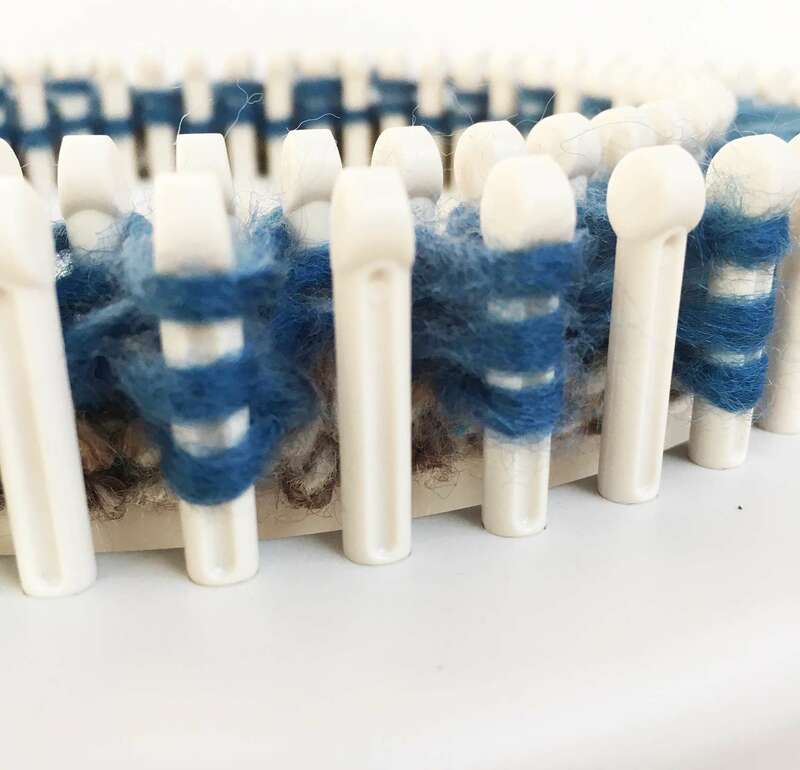 Take the stitch from peg 3 and place it on peg 4. Purl these two together. 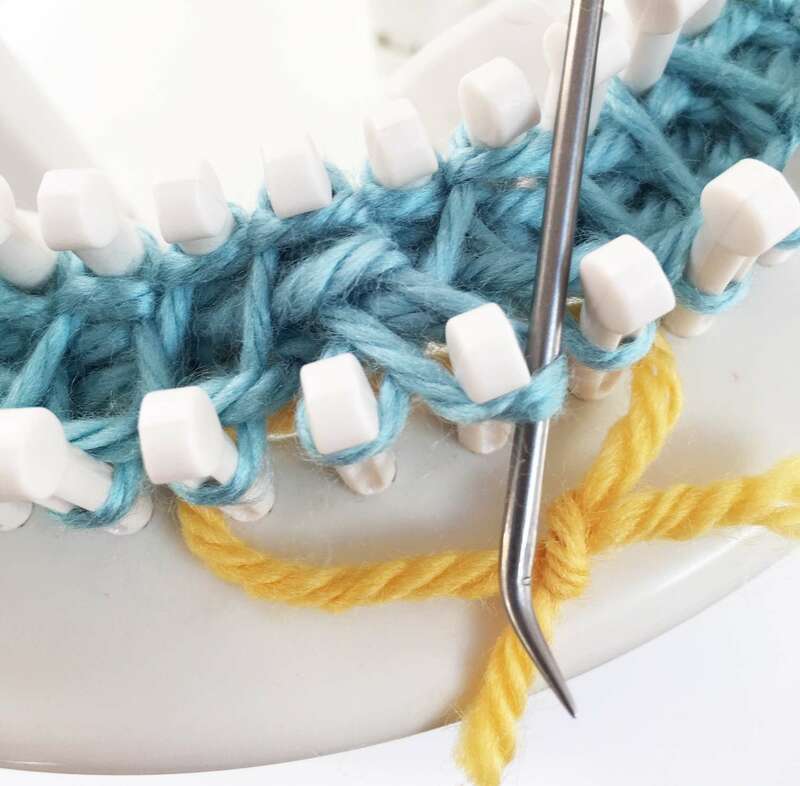 Continue in this manner, purling two stitches together all around loom. Remove from loom: Cut yarn 12.5” long. Now with darning needle pull each stitch off loom. 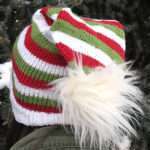 After all stitches are on needle, turn the hat wrong side out and pull the yarn tight, closing up top of hat. Weave in ends. The cast on edge will be a little curly. Block flat. Cast on 24 stitches, purple loom, prepare to work in the round. Round 1- 3: Purl to end of round. Round 4-6: Knit to end of round. Round 7-8: Purl to end of round. Round 9-12: Knit to end of round. Work heel in short-rows over the first 12 stitches. Place a peg marker on peg 1 and peg 12. Knit from 1-11. W&T 12. Knit from 11-2. W&T 1. Knit from 2 -10. W&T 11. Knit from 10-3. W&T 2. Knit from 3-9. W&T 10. Knit from 9-4. W&T 3. Knit from 4-8. W&T 9. Knit from 8-5. W&T 4. Knit from 5-9. W&T 10. Knit from 4- 10. W&T 11. Knit from 3 -11. W&T 12. Pegs 1 and 12 have two wraps and the stitch. 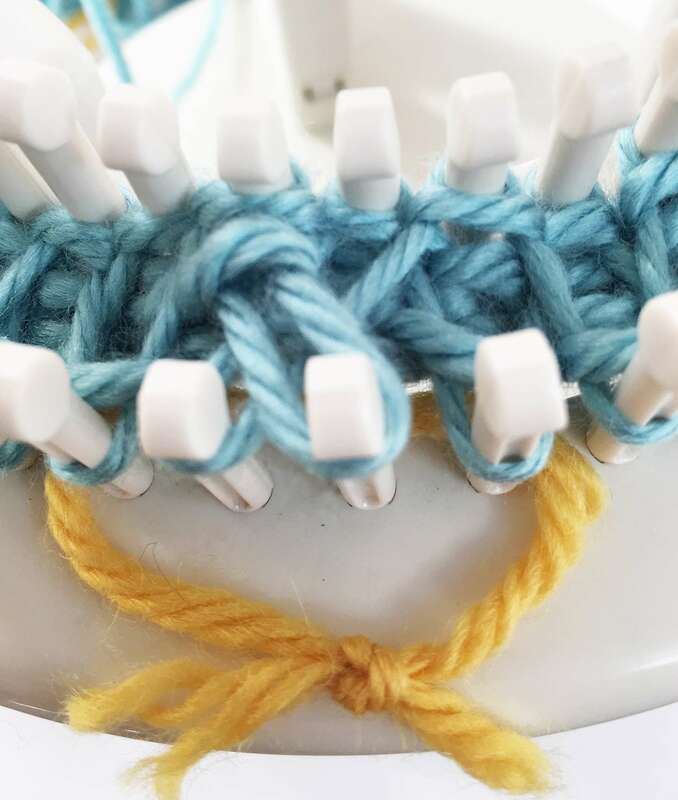 On the first round of the sole and foot, work the pegs with the extra wraps together with the stitch. Foot: Begin working in the round once again. 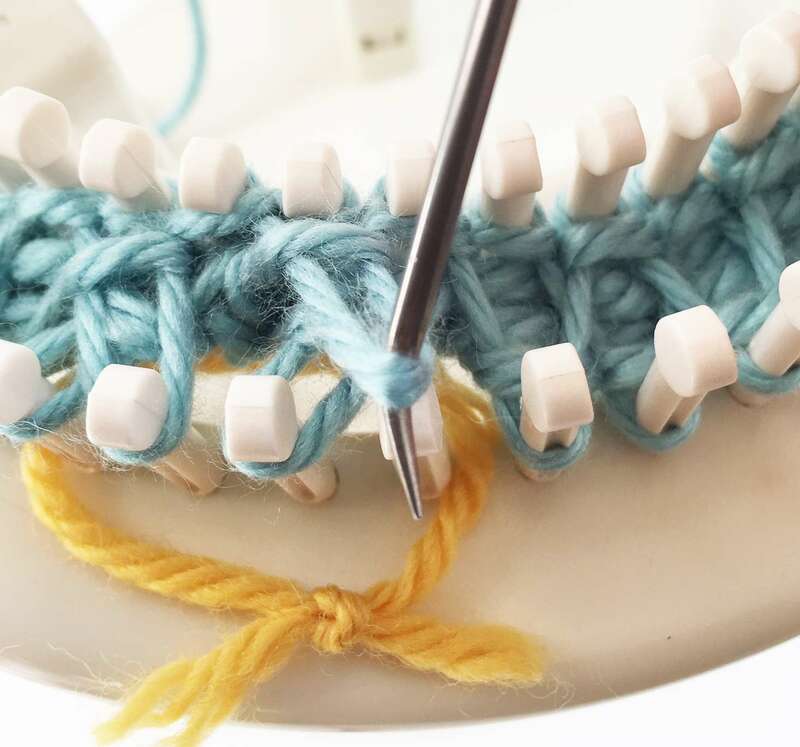 Next round: knit to the end of round (be sure to pick up the wraps from peg 1 and peg 12). Next round: knit to end. Rep last round until sole measures 3” from back of heel, or desired length. Toe: Repeat exact same process used for heel. Now, take stitches off loom with darning needle, and sew the seam together with kitchener stitch. 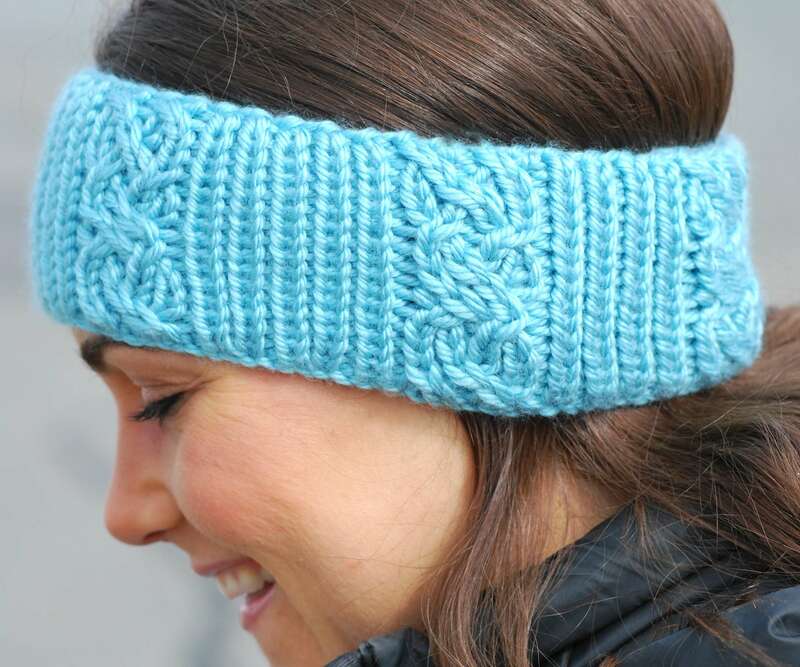 This is a great stitch for a chunky look, and is very easy to create even for a beginner. One side of knit is chunky rib, and the other side, regular stockinette. Sample knit with Loops and Threads, Barcelona yarn, #4. To begin, cast on all 52 pegs in stockinette. 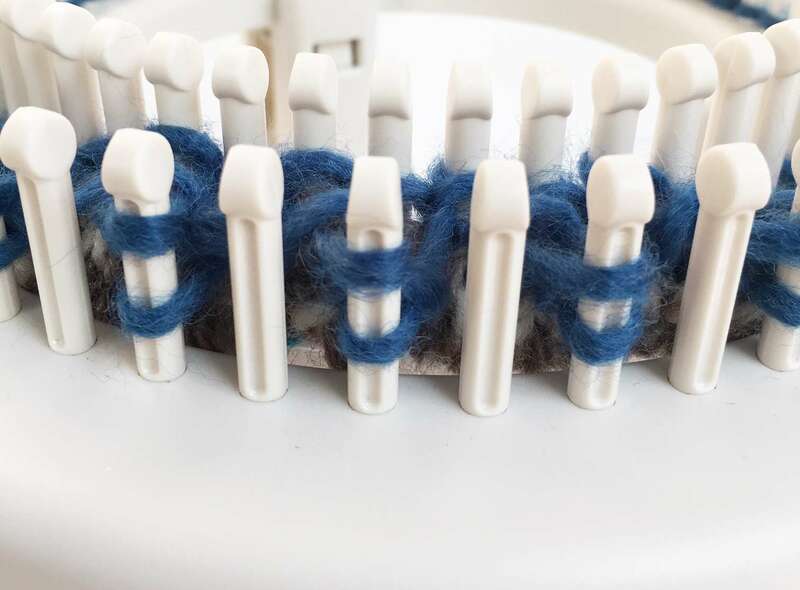 Then move (outer loom only) every other loop to next peg, so that one peg is empty and the next one has 2 loops. 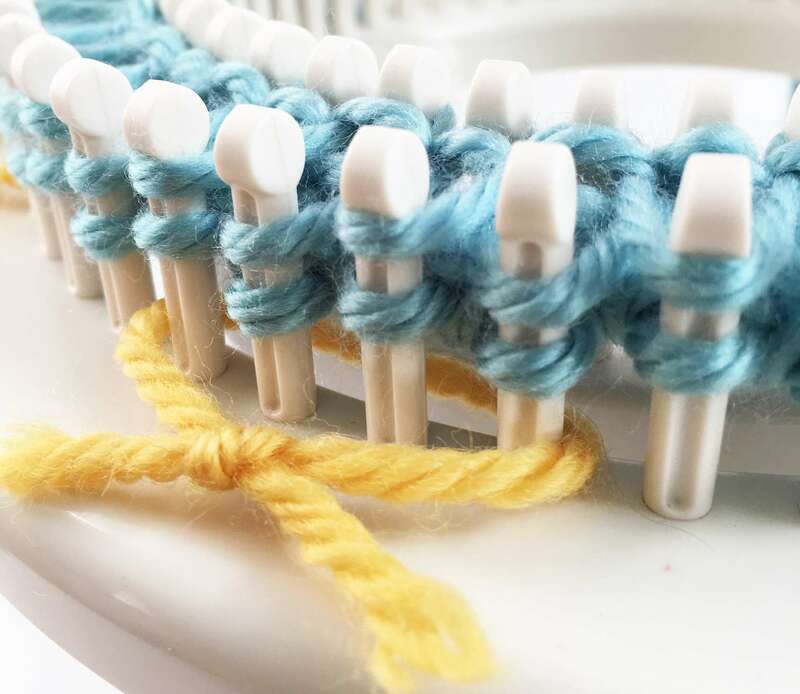 Do this all around the outer loom. Weave in stockinette always wrapping the pegs with 2 loops on the outer loom, and on the inner loom, wrap all pegs. Be sure to keep the empty pegs empty. This will create 3 loops on every other peg and the empty pegs stay empty. Work with loose tension. Continue the round so that the pegs with 3 loops, now have 4 loops. 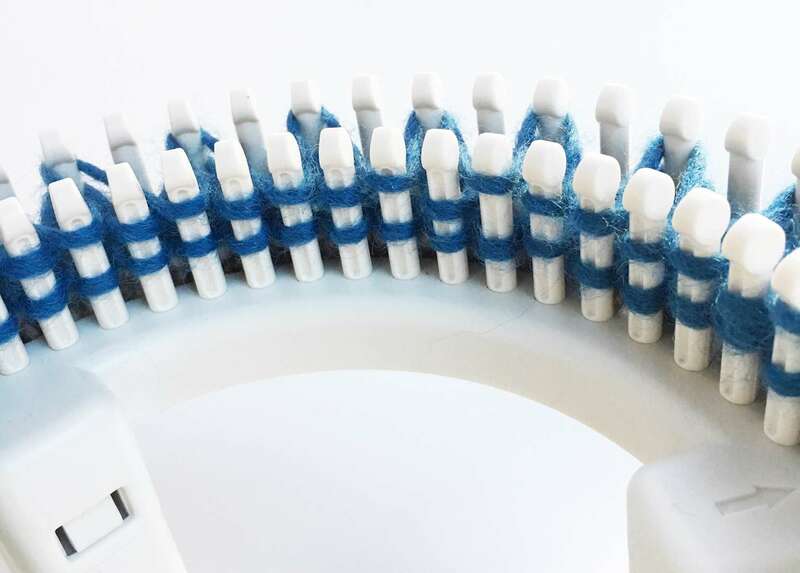 The outer loom will have 4 loops on ‘every other’ peg. Hook over 2 loops over 2 loops on outer loom and 1 loop over 1 loop on the inner loom. Then repeat the process. The inner loom will have just 2 loops. Hook 1 over 1. 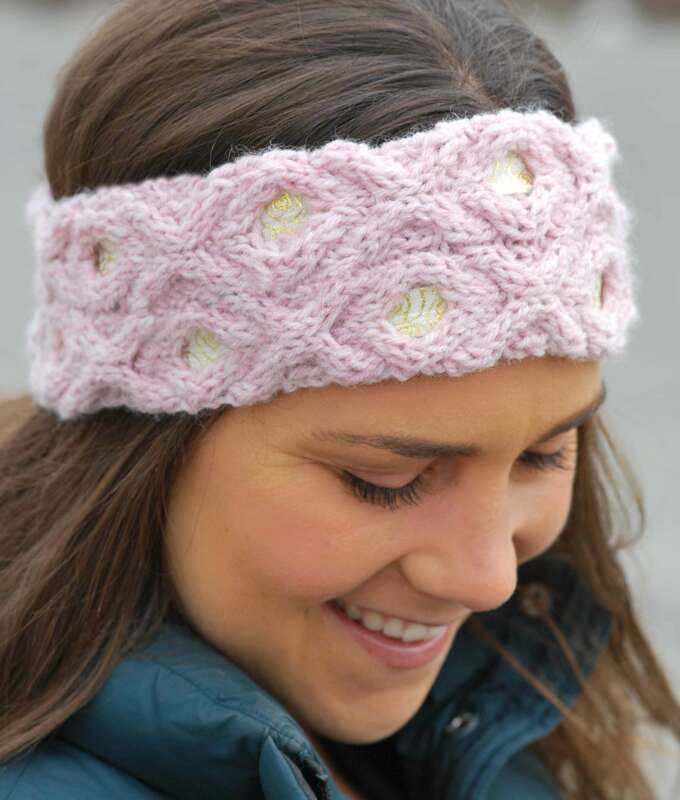 To create the headband above, work a total of 14 rounds in open rib stitch. A thinner or wider band can be made, depending on how many rounds are worked and desired. Bind off with basic bind off with crochet hook. HI, Are you having a problem with this stitch? If so, please tell us about it as we want to make it easy for you. At what point are you having a problem and maybe we can explain it better. I have both sizes of looms for the rotating loom and am wondering what other loom sizes or head sizes they fit. I can’t wear hats off the 36 peg loom. Prefer the 41, 48 or 60 peg looms, 1/2”. 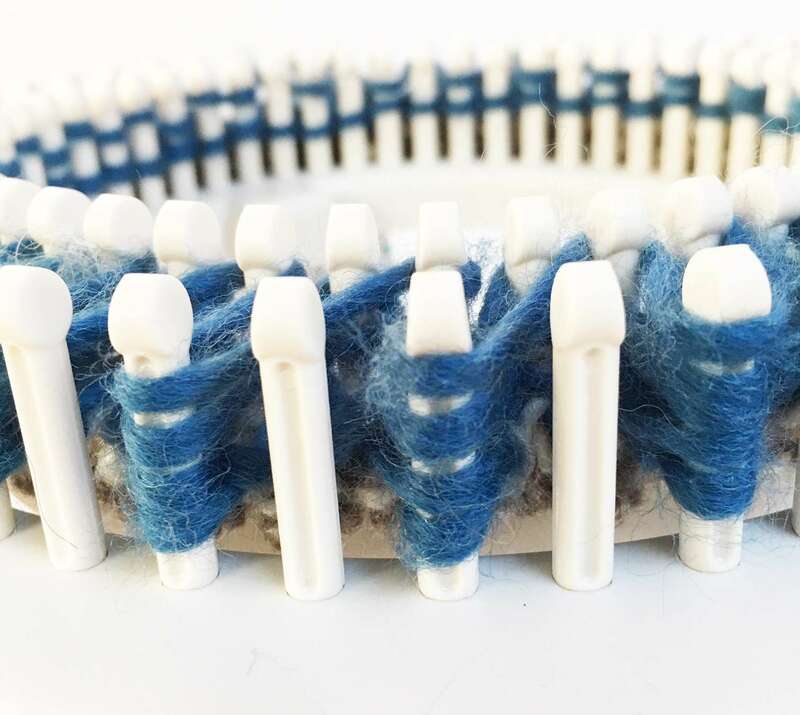 The 52 peg loom makes hats about 20-21″ in circumference working in double knit. 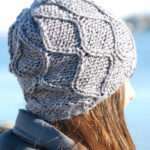 The 60 peg one will make hats up to 23-24″ depending on the yarn and stitch pattern used, in double knit. 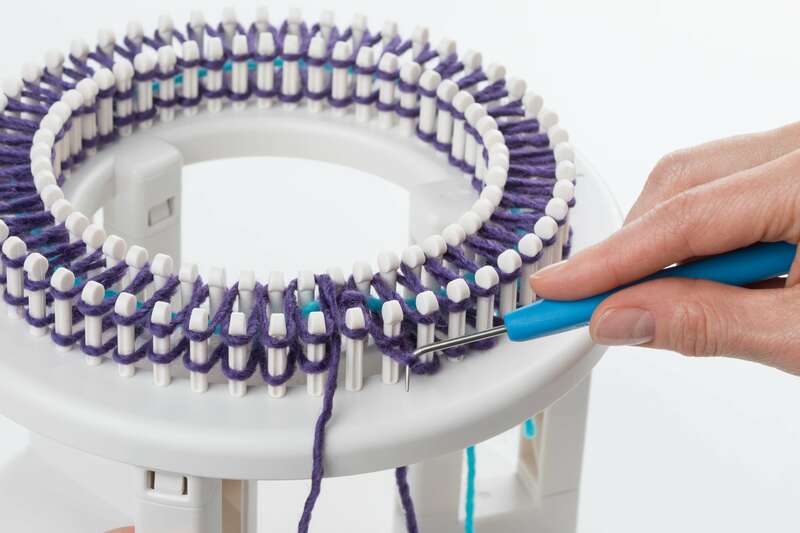 If you have other size looms, you can attach them to the base of your loom with the loom connectors. Also, you can make single knit hats by using just the outer looms of both sizes. Does this answer you questions? If not, let me know how we can help further.